The flow of tourists from Uzbekistan to Azerbaijan increased a lot in 2017, Ambassador Extraordinary and Plenipotentiary of Azerbaijan to Uzbekistan Huseyn Guliyev said in an exclusive interview with Trend. He said that the embassy is carrying out extensive promotion in the sphere of tourism in Uzbekistan, and this strategy brings successful results. "In 2016, the figure [the number of Uzbek tourists] exceeded 19,000 people. By the end of 2017 the figure has multiplied many times. 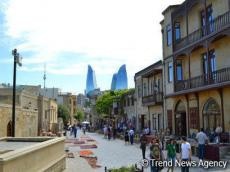 According to the conducted surveys, Uzbek tourists show great interest to the Naftalan sanatorium and to Baku and Gabala cities of Azerbaijan," Guliyev said. He added that the Naftalan health center is recognized by Uzbek tourists as the most unique balneological resort not only in the CIS, but in the whole world. The ambassador reminded that in order to develop cooperation in the tourism sphere between the two countries, tourism associations of Uzbekistan and Azerbaijan signed a memorandum of cooperation during the "World of Leisure" 5th Tashkent International Tourism Exhibition in 2017. "The signed memorandum summarizes bilateral experience and provides for exchange of information, organization of joint tours and events related to the promotion of tourism, organization of mutual trips to promote health tourism between the two countries in order to increase the flow of tourists," Guliyev said. He also added that Azerbaijan Airlines (AZAL) plans to open Baku-Tashkent direct flight on June 30, 2018. Flights will be carried out once a week on Saturdays, and twice a week on Wednesdays and Saturdays from August 1.